Posted by CCLD in West Elmira. Ahnece- “The vast difference between reading the book and watching the movie was quite enlightening. I have always surmised that movies rarely do justice to a book however, after viewing A Fault in Our Stars, there is no question in my mind that this is true. 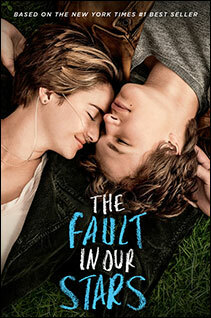 Mary Ann- “John Green’s novel The Fault in Our Stars is a gem which conveys so much sadness yet is never maudlin. Can the movie touch us with the same empathy and sense of futility? First of all, we must realize what books do well. They probe the inner being of the characters and reveal those qualities of heart and mind that place them in our universe. Movies also do this, but heighten and amplify the author’s setting where the characters play out the drama of their lived. A skillful director can enhance setting with camera angles and use of lighting. Brilliant actors can convey the inner character through expression and gesture. They can capture emotion. The movie The Fault in Our Stars captures the futility, grace, grandeur and depth of the lives of Hazel and Gus. The director augments their skill with the use of music and electronics, especially their iPhones which allow them to be connected even when they are apart. They also enable them to become acquainted. Through music we can experience tenderness, guarded optimism, their anticipation and delight about their trip to Amsterdam, the romance and fleeting pleasure of their dinner with Classical violin music. When Hazel struggles to climb the stairs to Anne Frank’s attic, the music and Anne’s voice-over add to our admiration and certain hopelessness. When Gus is dying, music replaces dialogue. Their love is connected- a look transmits all feeling. We know that Peter Van Houten’s book stops mid-sentence with no resolution. Gus’s life ends the same way. Music helps to convey that “the world is not a wish-making factory” their dreams futile but beautiful. Claire- Comparing books and movies are like comparing pears and peaches. In my opinion, the book is always better than the movie, however, The Fault in Our Stars came very close. I enjoyed how the movie used much of the same dialogue and wording as the book, especially the popular quotes. “There were several characters and parts that were left out of the film, however, the theme rang true”, said my friend Katie Ronsivalle. My favorite parts of the movie were the Easter eggs hidden throughout. For example, Hazel and Augustus both had “The Hectic Glow” posters in their room, and Requiem for Mayhem could be seen on Hazel’s nightstand. Overall, the movie mimicked the book almost perfectly, but no matter how you look at it, the book was better. Stop in and let us know what you thought of the movie! Also, check out our new YA book club or ask us what the Adult book club selection is reading this month. With his novel The Good Lord Bird James McBride can stand shoulder to shoulder with the likes of Mark Twain and John Steinbeck. The book is thought provoking, passionate and beautifully written. It is also a great read of the kind that will have you glued to the page and regret leaving McBride’s world when it winds to its end. You come away wishing that McBride had gifted us with, at least, two or three hundred more pages. The Good Lord Bird takes place in the “Bloody Kansas” of the 1850s where the question of its being a free or slave state was being argued with swords and blood. It is the picaresque story of Henry, a young slave who is – more or less – forced into freedom. To keep his rocky freedom, life and – truth be told – have an easier time of it, he dons a dress and becomes the comely “Onion”. The moniker is bestowed by no less a personage than John Brown. “Onion” finds “herself” pulled into Brown’s orbit and witnessing the God obsessed madman’s career from the Scourge of Kansas to his martyrdom at Harper’s Ferry. Along the way Onion meets the likes of Frederic Douglass and Harriet Tubman as well as having his disguise threatened by young love and lust. McBride surveys the institution of slavery with a cold, clear eye. One sees the horrors, degradation and twisted values that slavery inculcated. At the same time there are surprising depths of compassion for the slave, the slave owner and those around who find themselves caught up in the historical tide. Violence flares up at the drop of an insult or a madman’s whim. Historical personages we now regard as secular saints are seen to have flaws aplenty that – strangely – add to their stature rather than diminish. The only character to retain her mythic proportions is Harriet Tubman, who comes across as fierce and canny a revolutionary as any born in the 20th century. All of this is brought to us in a rollicking, very funny and truly affecting tall tale. I cannot recommend The Good Lord Bird high enough. Now here is my secret. It is very simple. It is only with one’s heart that one can see clearly. What is essential is invisible to the eye. 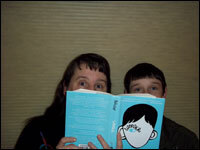 My son, Benjamin, and I recently finished reading Wonder by RJ Palacio together. The story follows 5th grader August Pullman as he begins his journey to Beecher Prep School after many years of home schooling. August is funny, smart, and kind, but his parents are concerned that he will not fit in. In fact, his father feels Auggie’s mother is being overly protective, but deep down he is also afraid for his son. Dad says, “It’s like taking a lamb to slaughter.” Why? Because August is different. Despite all of his great qualities, August doesn’t look like other kids. He has a rare genetic disorder that caused a “craniofacial abnormality.” Even though Auggie has been through many surgeries, his eyes aren’t where they should be, he has trouble talking and eating, and he has almost no visible ears. When he was little, kids on the playground would recoil in fear. As he works his way through the acceptance process in middle school, he overhears the word “alien” more than once. He feels the pain of their stares or of quick glances and avoidance. In Wonder, the kids are afraid to touch Auggie and school-wide they say he has “The Plague.” At a recent Human Relations Commission meeting, a new member shared a story of her five year old daughter who had a classmate who was afraid to touch her because her skin might turn brown too. Especially in communities that lack diversity, acceptance is impeded by lack of familiarity and understanding. Ben: Kids in middle school do this all the time. For example, if a kid is a “dork,” and he touches you, then you have to pass “it” along to someone else so you don’t have “it” anymore. Palacio narrates her story not only with Auggie’s poignant words and feelings, but she includes other voices to tell Auggie’s story. His older sister, Via, tells what it is like to be the sibling in a family with a child who requires so much extra care and attention. While she is jealous of August’s special bond with their parents, she also vehemently defends him when people are cruel. She demonstrates the struggle of sibling rivalry where you genuinely wish the best for your siblings, but you don’t want them to have preferential treatment. Ben: That’s like my friend and his sister. He gets annoyed with her, but he never really wants anything bad to happen to her. When kids pick on her because she has special needs, he protects her. For Auggie, and for most middle schoolers, the hardest part of the first day of school is lunch. Who will they sit with at lunch? When Auggie sits down, no one sits with him. Finally, a girl named Summer sits with him because she feels sorry for him. Through the story, we see the friendship with Summer grows because she opens herself up to accept him. The reader learns that people who are different don’t want your pity. They want inclusion and acceptance, and, like Andrew’s parents, they have a better quality of life if they focus on what they can do rather than what they can’t. Ben: The first day of middle school, I was worried about who I would sit with at lunch. I found a table with someone I knew from my elementary school. In January, I switched tables because I had made some new friends that I liked better. Wonder focuses on Auggie’s journey to acceptance by his peers. As events unfold, Auggie’s parents offer that he may quit school at any time, but he doesn’t. He plods through the school year, meeting each academic and social challenge. Recently I read a newspaper article that Cornell University researchers have found a way to “grow” customized ears using a 3-D printer and injections of living cells. I thought of Auggie. Because most of his stigma stems from his looks, he wishes he could have ears. He is disappointed when his parents make him get hearing aids, but discovers that the long time underwater feeling finally disappears! At this point in the story, students in the school have come to accept Auggie, and no one says a thing about his new hearing aids. The reader comes to see that the story is not only about family, friends, and peers accepting Auggie for who he is. It is also about Auggie accepting himself. Ben: If I were Auggie, I would not really want to go to middle school. Middle school students can be very mean. Auggie continued school even when his parents offered to allow him to quit. Auggie had a lot of courage.